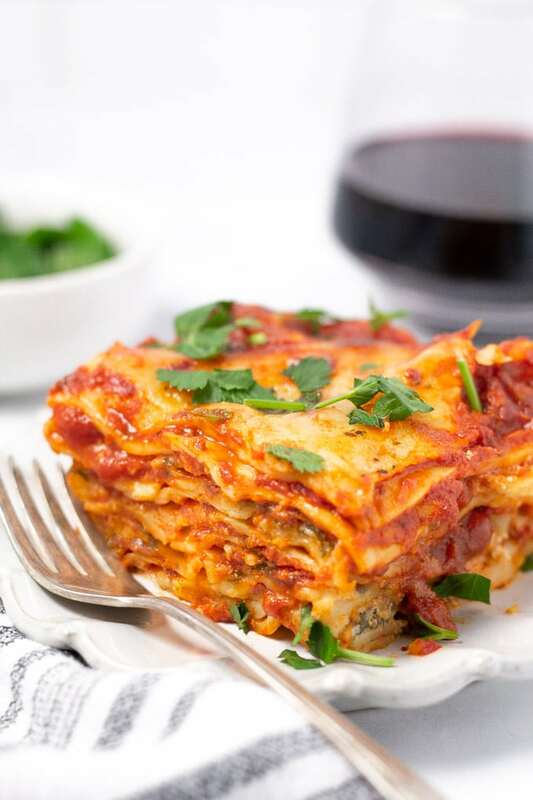 8 ingredients + 10 minutes of prep time = a hearty lasagna your family will love! Yes friends, you read that right!! 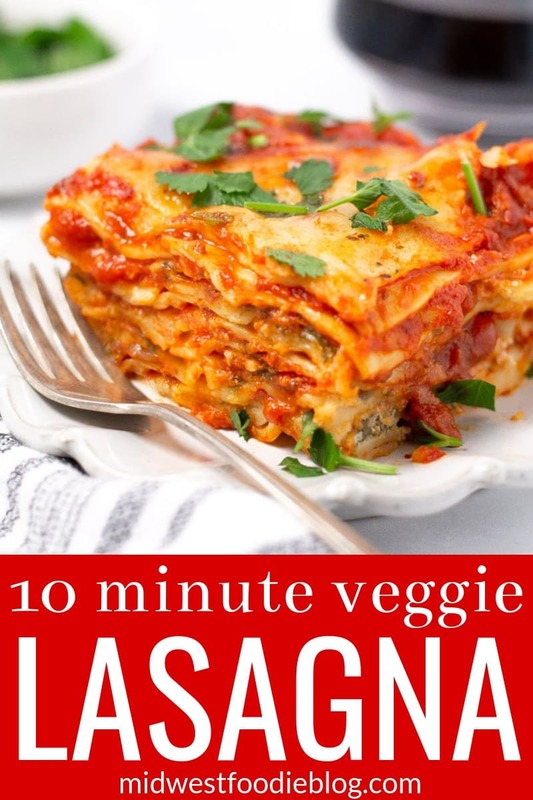 In this recipe I’ll share with you my secret for getting this lasagna in the oven in JUST 10 MINUTES. From my kitchen to yours, let me tell you right now that lasagna doesn’t have to be hard. It doesn’t have to be complicated. It can be something you throw together on Tuesday night and then bake in the oven while you walk the dog and get some laundry done. It is no longer reserved for Sunday nights or special occasions! I am here to let you in on a little secret. You DO NOT need to boil your lasagna noodles before you bake them! Let that sink in for a minute. With that said, assembling this lasagna will take you all of 10 minutes. It’s literally just layering sauce, noodles, creamy ricotta/cottage cheese/spinach filling and mozzarella a few times and popping it in the oven! They noodles will soak up the moisture from the sauce and the cheese (and spinach if you decide to add it) and they will come out perfectly tender. And in my experience, lasagna made with uncooked noodles often holds together better than it’s boiled noodle rival. I’d guess it has something to do with the starches that are released from the noodles during the baking process? But I’m not a scientist. I just like to make dinner as easily as possible. Start by combining the spinach, ricotta, cottage cheese, Pecorino Romano (reserving a half cup) and egg along a generous pinch of salt and pepper. Now it’s time to layer! Start with 1 cup of sauce in the bottom of a 9×13 inch pan. Then add 5 noodles, slightly overlapping. Spread 1/3 of the cheese mixture in an even layer. Then add 6 slices of mozzarella. Spread 1.5 cups sauce in an even layer. Add 5 more noodles, slightly overlapping. Then spread another 1/3 of the cheese mixture in an even layer. Add 6 slices of mozzarella. Spread 1.5 cups sauce in an even layer. And add 5 more noodles, slightly overlapping. Spread the remaining 1/3 of the cheese mixture in an even layer. Add 6 more slices of mozzarella. And spread another 1.5 cups sauce in an even layer. Add 5 more noodles. Spread another 1 cup of sauce. Add remaining 6 slices of mozzarella and add remaining half cup of Pecorino Romano in the open areas between the cheese. Cover tightly with foil and bake at 350 degrees for 50 minutes. Remove foil and bake for another 10 minutes. Broil for 1-2 minutes to get it a little brown and crispy on top. Let sit for 20 minutes, garnish with fresh chopped parsley and enjoy! Should I use “no boil” lasagna noodles? I’m not going to tell you how to live your life, but this recipe was written for regular uncooked lasagna noodles, so feel free to just use those! The no boil ones seem to have less noodles in the package and be more expensive. And in my experience, the no boil noodles tend to get overcooked quickly, creating an extra floppy lasagna. Can I make this lasagna ahead of time? Yes! Make it on Saturday when you have all the time in the world, and bake it on Thursday when you have 5 seconds to throw something in the oven for dinner! When I’m really planning ahead, I like to double the recipe and make two pans of lasagna so I can stash one in the freezer. The night before I know we’ll be eating the lasagna, I let the frozen pan thaw in the fridge. After you’ve refrigerated the lasagna and before baking, just make sure you let it sit on the counter for an hour to come to room temp so that it cooks evenly. Then bake according the recipe directions below. Can I use store bought pasta sauce? Yes! Of course! Don’t you dare feel guilty about using pasta sauce from a jar! Although, I do have the the easiest and MOST delicious spaghetti sauce recipe ever and it’s totally simple and do-able for you, it’s not a must and your lasagna is still going to taste great if you use Prego. Noodle count: I have found that the noodle count in a 16 oz. box of lasagna varies widely among different brands. If you find yourself with less than 20 noodles, when it comes to the middle layers, just use 4 noodles instead of 5. You want to have 5 noodles on the first layer and 5 noodles on the last layer. But there’s a little wiggle room with those middle layers. Feel free to switch it up with the cheeses. Use shredded mozzarella in place of the slices of mozzarella. Or Parmesan in place of Romano! Don’t boil the noodles before assembling. Save yourself some valuable time and start assembling your lasagna with uncooked noodles! Use regular lasagna noodles. The no boil noodles come with fewer in the package, yet they cost more. This recipe was written for regular lasagna noodles, so just use those! Make a double batch. 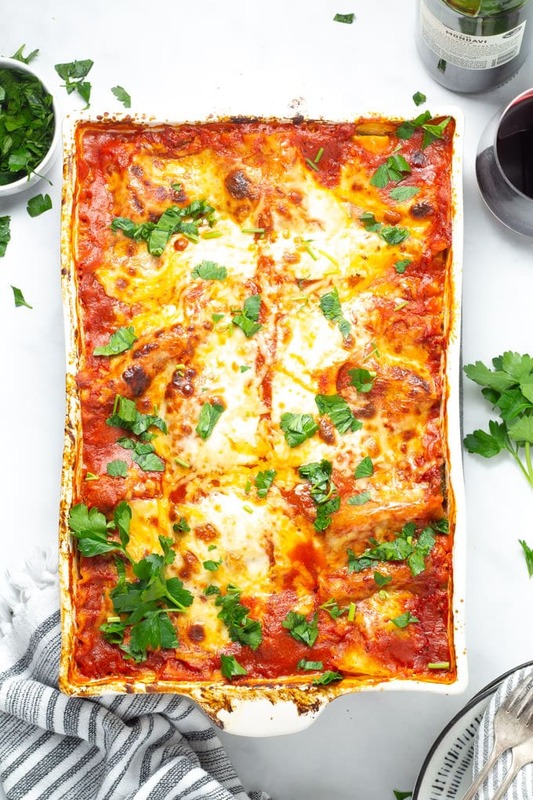 Double the recipe and make two pans of this lasagna so you can freeze one for later! Don’t boil your lasagna noodles! Layer them with your cheese and sauce and bake away. 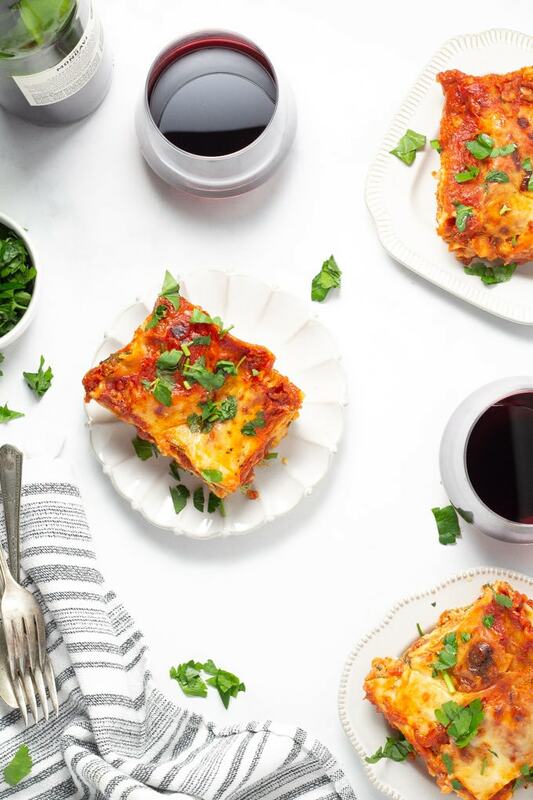 That’s the secret that makes this lasagna easy enough for a random Tuesday night dinner with your family. 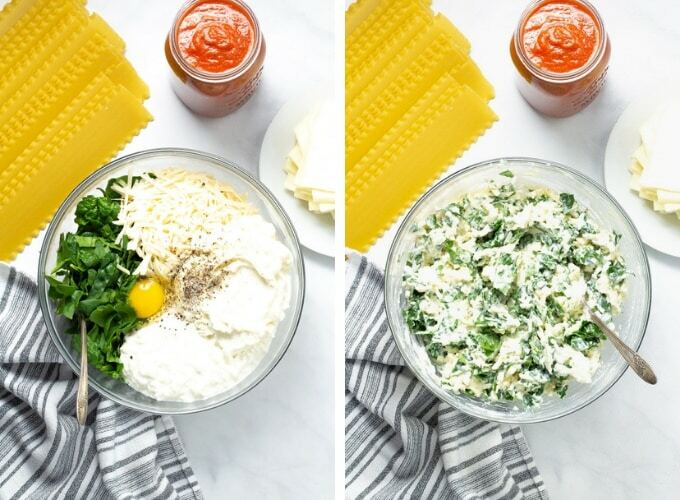 In a medium bowl combine spinach, ricotta, cottage cheese, egg, most of the Romano cheese (reserve a half cup for later), along with a generous pinch of salt and pepper. Pour 1 cup sauce into a 9×13 baking dish and spread across the bottom. Layer 5 noodles, slightly overlapping to cover the bottom of the pan. I like to do four noodles the long way, and then break off the end of a noodle to fit it widthwise and cover the rest. Layer 1/3 of the ricotta mixture in an even layer on top of the noodles. Then layer 6 slices mozzarella cheese. Then pour 1.5 cups sauce on top of that and spread in an even layer. Then layer another 5 noodles, 1/3 of the ricotta mixture, 6 slices mozzarella and 1.5 cups sauce. Repeat again – 5 noodles, remaining ricotta, 6 slices mozzarella and 1.5 cups sauce. Lastly, layer 5 noodles, 1 cup sauce, and the last 6 slices of cheese. Sprinkle the reserved Romano into the open areas where the mozzarella slices didn’t cover. Cover the pan tightly with foil and bake for 50 minutes. Remove foil and bake for another 10 minutes or until the noodles are al dente. Broil for 1 minute on high, just until the cheese starts to turn golden brown. Let cool for 20 minutes before serving. Garnish with parsley and serve with extra sauce on the side. This recipe was originally posted in September of 2018. 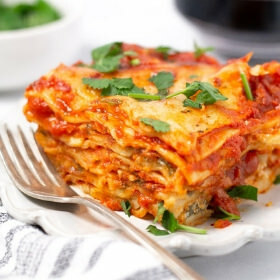 It was updated in March of 2019 to include detailed instructions, process shots and tips for making the perfect lasagna every single time! 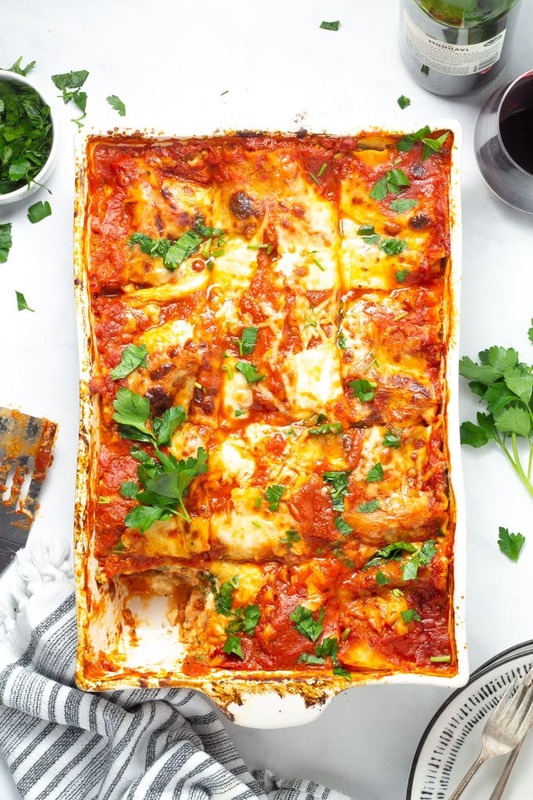 Dinner doesn’t get easier than this vegetarian lasagna!